Sell A House With Bad Tenants. Selling a house can be a hard task at the best of times, but trying to sell a house with tenants comes with its own additional hurdles. If you’re selling your house, there are two basic avenues you can go down when you have tenants. You can either wait for the lease to run out or to sell while they are there. Also, sometimes even though the lease is already done, the tenants will stay month-to-month, or simply stop paying. It can sometimes be harder to get the tenants to move after the lease is up because they have the expectation that the house is theirs essentially permanently now. Some leases have a clause that require tenants to vacate in 30 days in case of sale. 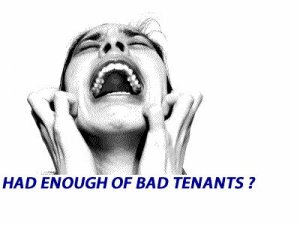 Often times, the tenants will ignore that clause. Make sure you understand your leases limitations before proceeding to sell. Often, only a full time house buyer like Charleston SC House Buyers is willing to take on the risk of letting the tenant remain or evicting them. The transition is not necessarily fun, but professional house buyers are equipped to handle any type of tenant. Once you’ve decided to sell here are some things to consider doing. You should make the tenant feel included by being transparent and keeping an open line of communication. Try to organise meeting with the tenants as a way of being polite and making sure everyone is on the same page. While, yes, it may be easy to simply write an email, this can leave things unclear leading to potential miscommunication. Meeting in person allows people to ask questions as they think of them ensuring understanding. If it’s difficult to meet in person, a good work around is to organise a Skype call. If you try to sell the house with a real estate agent first and do not meet with the tenants, even the very best tenants will make your life miserable when it comes time to show the house to buyers. In fact, even with good communication, there is almost a zero percent chance you can sell the house to a retail buyer when a tenant is in the house. Real estate agents don’t want to show tenant occupied houses and buyers know that the closing will not happen on the timeline they need. Here at Charleston SC House Buyers, we’re ready to buy you rental property today. If you’re wondering how to sell a rental property with tenants, we are the solution you’re looking for. Selling your house could be even quicker than you think. Make sure when you’re getting your house ready to sell that you ask the current tenants if they’re interested in buying the property. Most people stay in a rental for a long time because they fall in love with it and consider it their home. If they’re financially in the position, they might want to buy the house outright. They might love their location and be keen for the opportunity to buy in the home. With that said, it is rare that a renter can get a mortgage for a house, which is probably why they are renting. Then, if the tenant can’t buy the house, they can get upset if you sell it to someone else, even though they wouldn’t have cared if you didn’t offer the house to them first. This is a fine line- be careful if you offer the house for sale to the renters! It can be a lot of extra stress for tenants if you’re looking for ways how to sell a rental property with tenants. The house and yards need to be consistently clean and decluttered for frequent viewings. Who will handle this work? Don’t expect your tenants to handle the work-they won’t care if the house sells or not. If fact, they’d prefer it doesn’t sell! There are several incentives you can offer to ease the stress for tenants as well. For example, if the tenant is going to move, you can offer a free week’s rent once the house is sold to offset moving costs, provide a good letter a recommendation or discount the rent during the sales process. Even simply limiting the number of viewings or including the tenant in on that discussion can go a long way in making them feel more comfortable. Even with these incentives though, it is nearly impossible to sell a rental property with tenants on the MLS with a real estate agent. A standard part of a lease agreement is for the tenant to maintain the yard and house, but when selling a house, you need to do more than maintain. When you’re selling a house it needs to sing to the buyer; it needs to captivate them. It can be hard on tenants to keep up with maintaining the high standard for viewings when they are so frequent. Make it easier on them by hiring a gardener and cleaner just before every showing. By taking away some of the stress from viewings the tenants might even be happy for you to have more of them! As you can see the most important thing to do when selling a rental property is to be considerate and polite to your tenants. By being friendly and working with the tenant you’re likely to get more cooperation from them and have a much smoother sale. If you want to avoid the typical troubles of trying to sell a rental property with a tenant, simply fill out our brief seller form on this website and we will give you a fair cash offer for your home. We won’t even need to have inspections and appraisals that would upset the tenant normally. You can also call us at (843) 553-5005 if it’s easier. We look forward to giving you an offer for your rental home today.